“Three Days of Rain” gets its title from a cryptic entry in the journal of a deceased architect. Presented by Dragon Theatre, Richard Greenberg’s drama starts with three people and the discovery of the journal. It then journeys back 35 years to reveal its origin. 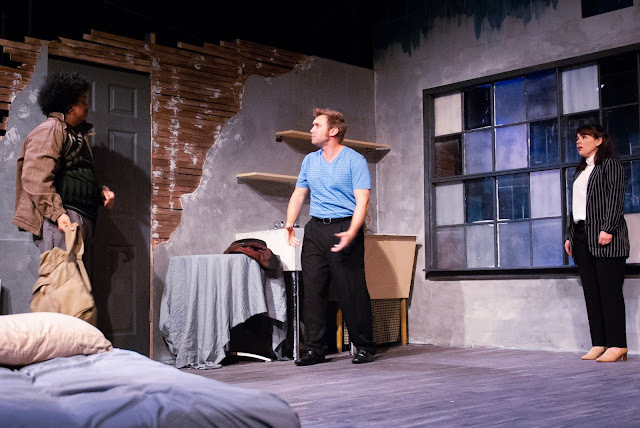 In Act 1, siblings Walker (Tasi Alabastro) and Nan (Katie O’Bryon Champlin) meet in the now-rundown apartment that their late father had shared with his business partner. Joining them is the late partner’s son, Pip (Robert Sean Campbell). Walker has just shown up after disappearing for 11 months, much to Nan’s chagrin. Now they’re planning to hear the reading of their father’s will. Walker, who discovered the journal, assumes they’ll inherit their father’s wealth as well as the famed house that he and his partner designed for their grandparents. Walker wants Nan to give or sell him her share of the house. Thus it comes as a huge surprise when their father leaves the house to Pip. In Act 2, the same actors appear as their respective parents. Alabastro is Ned, the siblings’ father; Champlin is Lina, their mother; and Campbell is Theo, Pip’s father and Ned’s partner. The “three days of rain’’ allusion in the journal proves to be pivotal in personal and professional relationships. This production is the last directed by Dragon founder Meredith Hagedorn, who has decided to step down from her post as artistic director. It’s a tough challenge that she and the cast don’t always meet. For one thing, the characters aren’t particularly likable most of the time, and they’re often in conflict. Alabastro’s Walker is too hyper in Act 1, but he’s more successful as the shy, stuttering Ned in Act 2. Campbell’s Pip and Theo both become too angry too quickly. Champlin does well as both Nan and Lina. Act 2 shows the accuracy and inaccuracy of assumptions in Act 1. It also reveals inherited character traits. This is especially true of Lina’s instability, which no doubt accounts for Walker’s erratic behavior. Thus the play has its appeal because of the way it resolves personal and professional mysteries. The apartment set, seen in both acts, is by Nathanael Card, who also did the lighting. Period costumes are by Jess McGovern with sound by Jonathan Covey. Running about two hours and 20 minutes with one intermission, “Three Days of Rain” will continue through June 17 at Dragon Theatre, 2120 Broadway St., Redwood City.